It is hard for consumers of electricity to understand why retail prices are what they are and how they are determined. It is beyond one blog entry to fully describe the process but in overview, the suppliers of electricity (generating companies) in a region offer to supply electricity to the market at a given price and the offers are accepted beginning with the lowest cost providers first, until enough energy is supplied to meet expected demand in the region. The price of electricity offered by the last electricity generator needed to meet the regional demand determines the market price paid by companies that supply the electricity to businesses and consumers. Retail prices are a function of the market price of electricity, plus many other costs such as transmission, special infrastructure charges, and profits by suppliers, among others. Much of these costs are determined at the state level by regulators, as well as the characteristics of the retail electricity market in the state (competition) and the practices and policies of the companies that supply electricity to retail markets. The end result is that retail prices for electricity in any state bear only a limited relationship to the cost of generating electricity in the state. The chart bellow shows that the cost to generate 1 million BTUs of electricity in New Hampshire is about in the middle of all 50 states. Vermont is also relatively low. Both states have a relatively lower generating cost per million BTUs because a significant portion of the electricity produced in their state is from nuclear generators. 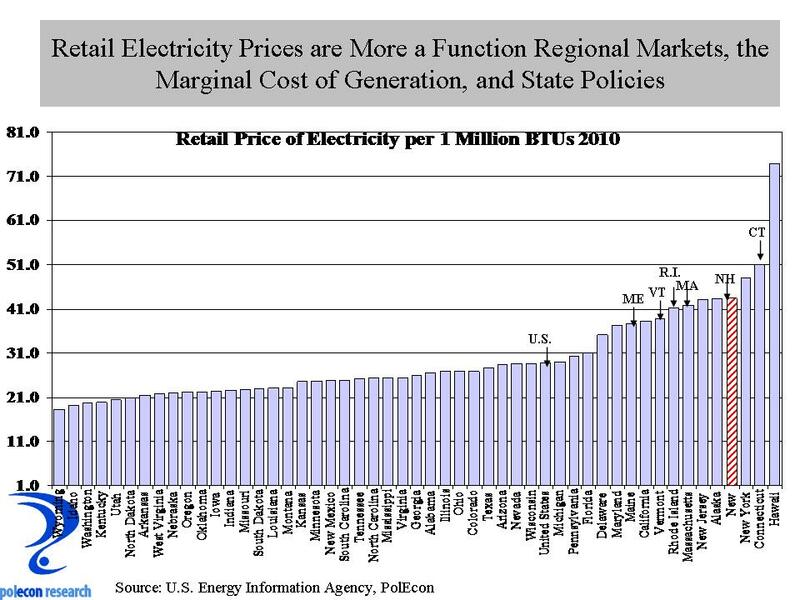 The correlation between the fuel costs to generate electricity in a state and retail prices per 1 million BTUs is modest, explaining less than one-third of the price per million BTU at the retail level. 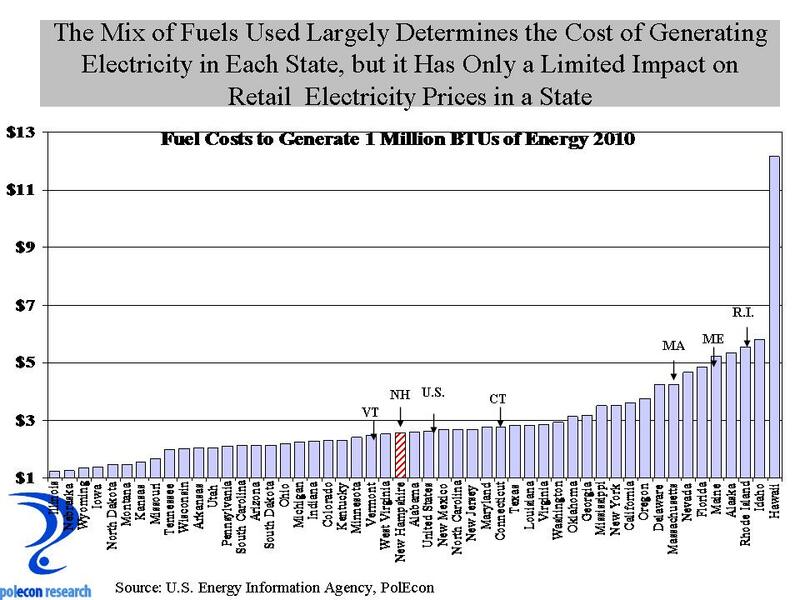 The chart below show that despite fuel costs that are in the middle of the pack, NH, VT and CT have high retail prices per million BTU of electricity. The regional nature of electricity markets along with the policies of state governments and the actions of individual retail sellers of electricity all play a role in disconnect between costs for generating electricity and prices at the retail level. We don’t have much control over the supplies of electricity beyond our state but we do have some control over the mix of suppliers of electricity which determine the cost of fuel for generation and we have a lot of control of the structure of retail markets and many other factors that determine the non-generating costs of electricity in the state and ultimately prices at the retail level. This entry was posted on October 24, 2012 at 11:55 am and is filed under Electricity, Electricity Generation, Energy, Natural Gas, NH Economy, Oil, prices. You can subscribe via RSS 2.0 feed to this post's comments. Rhetorical question, if nuclear drives the price down, why does the government make it so difficult to build a nuclear plant? What impact will the new EPA regulations regarding coal plants have on NH and regional retail prices? Years ago we went through “deregulation”. Did this reduce prices? What impact will natural gas have over coal in retail electric prices? Is the PUC functioning more to the benefit of the consumer or the generator?